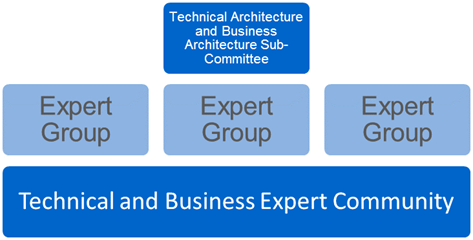 The Panel have established the Technical Architecture and Business Architecture Sub-Committee (TABASC), in accordance with Section F, to provide advice and guidance to the Panel regarding the Technical Code Specifications, the End-to-End Technical Architecture, and the Business Architecture. The list above is not inclusive of all of the TABASC’s duties. The TABASC have developed a set of principles to facilitate the assessment Modification Proposals, which can be found on the right, under Documents. Due to the wide and varied nature of the duties that fall within the Technical Architecture and Business Architecture Sub-Committee’s (TABASCs) remit, the TBEC has been established to support and provide expertise to the TABASC when required. The TBEC undertakes specific activities (including work packages) that involve in depth review and the necessary expertise when required. For each work package that the TABASC highlight as needing expertise, an Expert Group will be formed and pooled from members of the TBEC with the relevant expertise. This group is aided by the Technical Experts from SECAS, who provide the relevant documentation required for discussion and review. The Expert Group then report back to the TABASC with its findings. consider and recommend solutions to testing issues and Disputes with a technical aspect. As a member of the TBEC there is a voluntary time commitment. If a member is asked to be involved in a particular Expert Group this may involve; meeting attendance, review of documentation, responding to consultations and information requests, etc. For each work package, the selected TBEC members will be provided with an expected time commitment in order for members to confirm their availability. The TBEC is not limited in number nor are members required to be a SEC Party. To nominate yourself (or another) to become a member of the TBEC, please complete the form provided below and return it to SECAS@gemserv.com. For more information, please contact the SECAS helpdesk.